My EL students do a weekly reading and I use GF in a Hyperdoc style to guide them through the reading. The culminating task has them write: a summary, an opinion, etc. based on the article. In this task, students will write an opinion on facial recognition software after going through the Engagement, Explore, and Eplain phases. Evaluate is done throughout based on the nature of the tool. In this video, what do you see happening as the guy in the black jacket is walking through the subway? What are the 'ads', the 'commercials' doing with him as he walks through the subway? 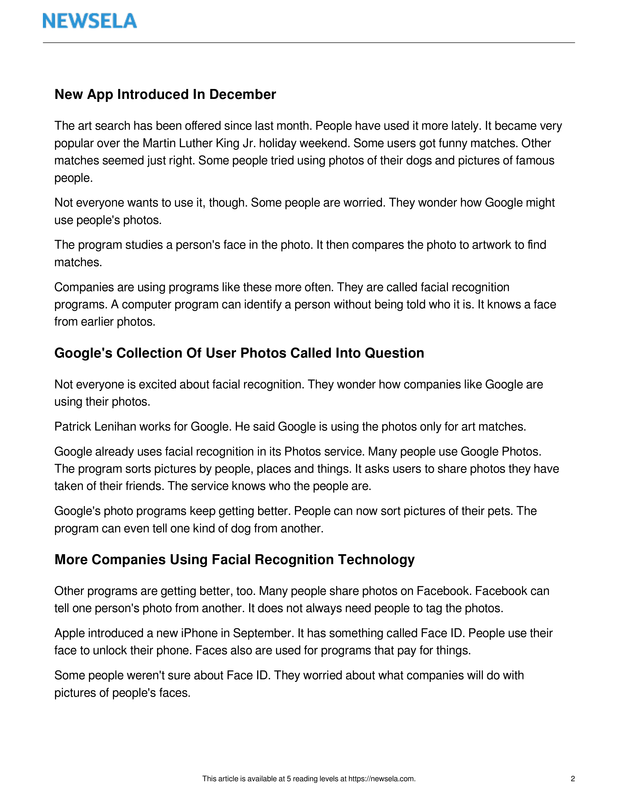 In the article, we will be learning about facial recognition software and privacy. You will be able to try what the app describes as well. Do you have any concerns about privacy when you are using apps on your phone? What concerns do you have? Use the link and have Read and Write read it to you. Based on reading the first section and the first paragraph of the second section, what does the latest version of the Google Arts and Culture App allow you to do? Use your own words. Google says they only store your photo during the time to search. What is the concern people have for the facial recognition software? What does facial recognition software do? How has facial recognition software helped you with your apps? What are some other ways that facial recognition software has been used by other companies? 1) Take a screenshot after it finds your picture. 2) Upload to Google Drive. Why is the app called Google Arts & Culture important? It lets people share photos of different things online. It lets people find out who they look like in a famous artwork. It lets people have a lot of fun on a holiday weekend. It lets people see artwork from museums around the world. Which of the following happens LAST? An app studies a person's face in a selfie. A person takes a photo called a selfie. An app matches a person's selfie with a face in a famous artwork. 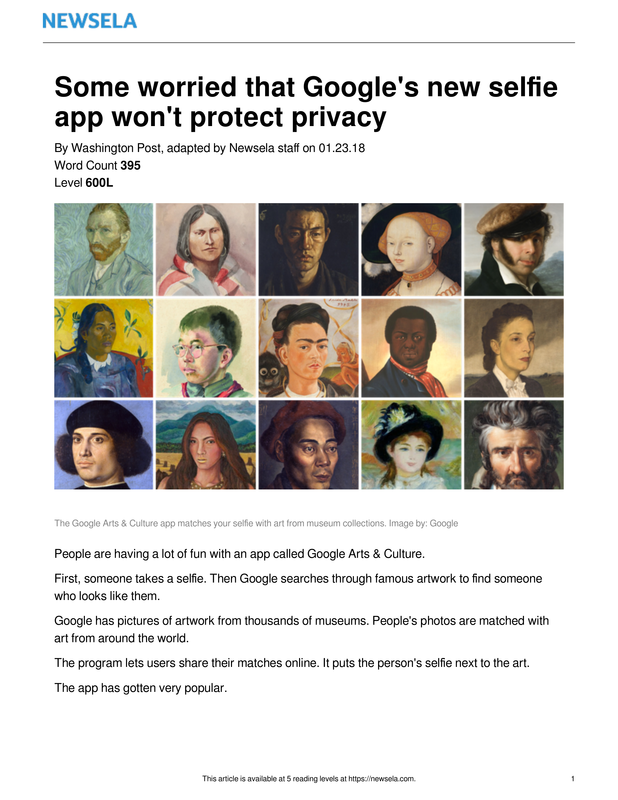 An app compares a person's selfie to a face in a famous artwork. Read the paragraph below from the section "New App Introduced In December. without being told who it is. It knows a face from earlier photos. Which question is answered in the paragraph? How many companies are using facial recognition programs? What is a facial recognition program able to do? How many photos does a facial recognition program look at? Who developed the first facial recognition program? Read the section "More Companies Using Facial Recognition Technology." Apple introduced a new iPhone in September. It has something called Face ID. Faces also are used for programs that pay for things. Do you think facial recognition software can be beneficial/helpful? Give 1 reason why you think it can be helpful and give 1 reason why it could be bad.